Get free tickets, resort credit, and save up to 20% on a 5-night Vegas vacation. Select resorts offer free nights and spa credits. Book a package deal and enjoy free breakfast, free wi-fi, and up to 30% off your stay. Save on flight + hotel, and choose options such as rental car, food, drinks and activities. Ready to plan your next big getaway but don’t have time to search several sites for cheap flights, hotels, and rentals? Let Travelocity be your personal travel agent. With incredible deals on all-inclusive vacation packages to top destinations like Florida, Hawaii, the Caribbean, and more – Travelocity will simplify your itinerary and your tourist life. Reserve a Travelocity vacation package promo code when you book your next trip and make a break for it without breaking your budget. Travel planning can be a hassle especially if you’re traveling on a budget. Trying to find low priced airfare, stays, and ways to get around on the endless number of discount travel sites can cost time and energy that you don’t have. Thankfully Travelocity offers all-inclusive vacation packages that take the guesswork out of getaways. Simply select your dream destination and Travelocity handles the flight, hotel, food, and rental details for you with one easy reservation, billing, and confirmation code. Travelocity not only delivers you stress free, pre-planned vacation deals – they also offer deep discounts on activities packages to help make sure that you have a memorable trip. Choose from major attractions, outdoor adventures, sightseeing passes, or reduced tickets to live shows and sporting events to make the most out of your time away. Unlike other sites, the Travelocity Guarantee, TotalPrice, and Price Match policies protect you against sojourn setbacks like lost reservations, hidden charges, hotel renovations, and missing rentals. Travelocity has been in the business of changing lives one trip at a time for more than 16 years now. The site was born back in 1996 as the internet brainchild of SABRE and American Airlines. 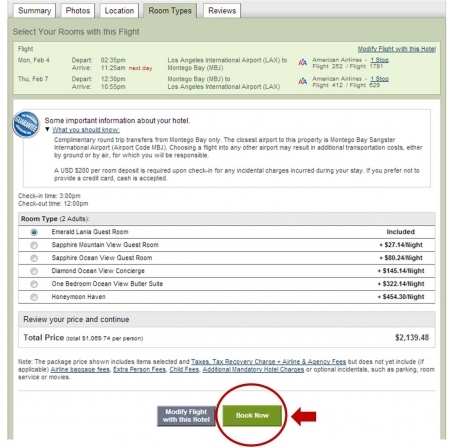 From its simple beginnings as a quick way to reserve, book, and purchase tickets via the web without the help of a broker – Travelocity has evolved into the leader of hospitality. Today Travelocity holds the sixth spot as largest travel agency in the United States and a close second in travel agencies online. Travelocity believes that conscious vacationing is enriching and they are committed to making our world a better place through travel. They host a Travel For Good site, which features green travel options including ecohotels, hybrid cars, and carbon offsets. Travel For Good also encourages globetrotters to contribute back to their preferred places and global community through Voluntourism – even giving $5,000 grants to deserving travelers. Life is too short to spend in one zip code. Choose the road well traveled by visiting Travelocity and booking one of their incredible vacation packages today. While Travelocity helps you plan your next great escape, we at CouponPal are here to help you take an overspending sabbatical. Take advantage of a Travelocity vacation package promo code at checkout and get once in a lifetime savings on your dream vacation. Vacation packages are fabulous because you book an entire experience all at one time! Hotel, flight, tours, and dining can all be booked through your online travel agency, Travelocity. Many vacation packages can be purchased for a lot less than you think. Use a Travelocity vacation package promo code to help you keep more money in your wallet for when you arrive to your destination. 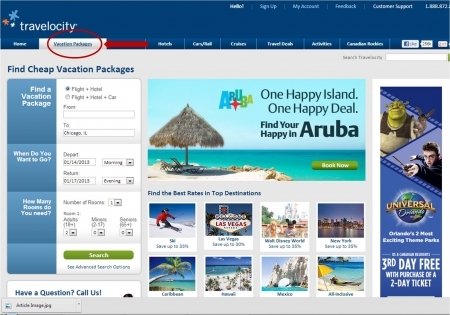 On the Travelocity homepage, either click "Vacation Packages" from the top links, "Find the Best Rates in Top Destinations" from the center of the page or, click a "Featured Vacation." If you know where you want to go and the dates you want to go, do a custom search on the left side of the screen. Choose if you want flight and hotel, or flight, hotel, and car. Enter your from and to locations. Select the dates of your trip as well as how many rooms you will need. Then click "Search." You will then be provided with Vacation Package search results. You can filter through the results by clicking "Apply filters." You can also narrow your search results by adding criteria to your search such as how much you want to spend per person, the star rating, or which neighborhood you want to be in. Once you find the hotel you want, click "Book Now." Select the type of room you want. This may be choosing the mattress size you want in your room or selecting which view you want from your hotel room balcony. Click the radio button in front of the type of room you want and then click "Book Now." Rental car companies will be presented to you. Each company will display the size of the car and the price it will cost for your trip. Select the radio button below the class of the car that you want for the trip. 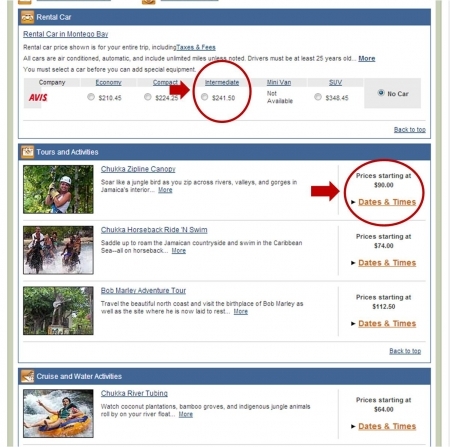 Then click "Dates & Times" to add any tours, activities, or cruise and water activities. Afterwards, click "Continue." First, review the price of your hotel and car. Next, if you want to add insurance for your trip choose the option to add the "Travel Protection Plan." 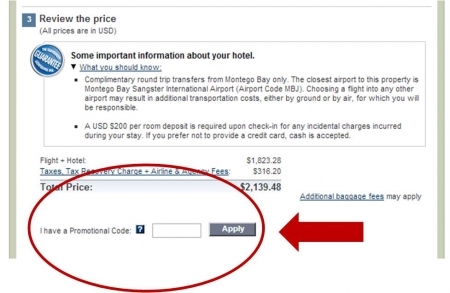 After deciding if you want to add insurance, add your Travelocity promo code in the "I Have a Promotional Code" box. 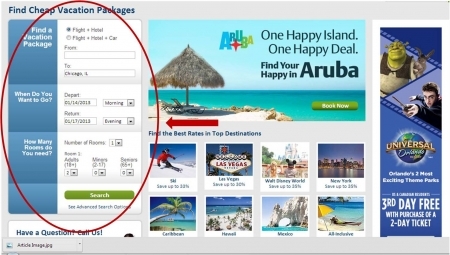 Click "Apply" to add the Travelocity promo to your purchase. If you are an existing Travelocity member, use your log-in information to continue. If you are a new Travelocity member, click "Continue." 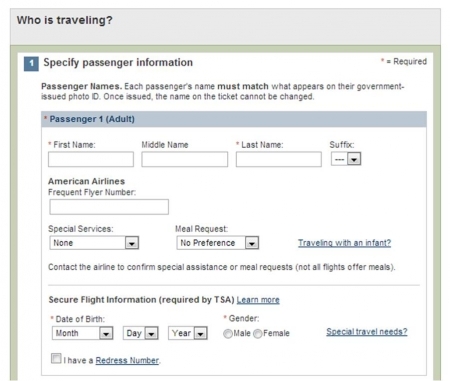 Enter each passenger's contact information such as first name, last name, and date of birth. Each passenger's name should match the information provided on the government issued id that will need to be presented at the airport. Confirm the passengers name for the flight is correct. Select the passengers name that will be checking the group into the hotel upon arrival. Also, select the contact that should receive all travel updates from Travelocity. You can choose to either let Travelocity pick your seats or you can request specific seats. After picking all the seats for all of the passengers, click "Continue." Review the price, select your payment method, enter your billing information, agree to the policies, then complete reservation. Click "Agree and Complete Reservation." My little sister and I just returned home from an unforgettable weeklong whirlwind in Paris. A dorm mate overheard us talking about French gents and street cafes and suggested that we check Travelocity for an all inclusive European vacation package. Within a few quick clicks, we booked nonstop flights and a chic Parisian suite, just minutes away from the Eiffel Tower and the Champs-Élysées. We even took advantage of a Travelocity Vacation Package promo code from CouponPal, which made our wallets go ooh la la. From the Travelocity home screen, booking was easy. We just clicked on Vacation Packages, right at the top of the page. From there we entered the destination, number of guests, and our dates. We were even able to key in our airline preference, so we could both earn international rewards miles, and request a two bed, non-smoking room. Since we were having trouble deciding if we’d need a rental to get around, we reached out to Travelocity experts. We got a quick email reply, within minutes, giving us detailed info about public transportation and the famed Paris metro. All from the comfort of our computer screen, we were able to view photos of Paris hotels and surrounding areas. We narrowed down our search with Travelocity’s easy-to-use filters, which displayed results by star ratings, neighborhood, price, and package discount. We even had access to real life traveler reviews, so we knew what to expect, all before being locked into a reservation. 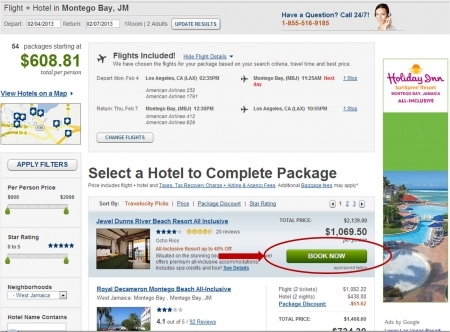 Once we used the compare option and saw the Travelocity vacation package savings versus its competitors, we were sold. We selected our perfect package, along with deeply discounted Paris Sightsee Passes, and were taken to the booking screen. There we had the option of sharing our itinerary with family and other croissant loving friends. We quickly made our reservation with a credit card and had one easy confirmation code for our flights, hotel, and passes – all under 60 seconds of booking. Using Travelocity Vacation Packages, we were able to put together our once in a lifetime trip to the City of Lights, within 20 minutes of logging on. Travelocity made our childhood dream of Paris an affordable reality. We were able to spend an amazing four nights, in a four star, for a fraction of the cost. We highly recommend using Travelocity whether you’re booking an all-inclusive vacation package or simply seeking ways to jet set for less by subscribing to their FareWatcher alerts, Weekly Roaming Gnome newsletter, or Window Seat blog. Take advantage of a Travelocity Vacation Package promo code when you reserve your next great escape and say, “au revoir, sayonara, adios, cheers, goodbye, and see you later” to overspending.